University and the College of Charleston, and serves on the Board of Directors for Drayton Hall. He holds a BA in Architectural History from Trinity College and a MS in Historic Preservation from the University of Pennsylvania. Prior to this, Mr. King worked in real estate development focusing on historic renovations and infill projects in Savannah, GA. and Charleston, SC. He also consulted on preservation projects. He is certified as a Building Analyst and Envelope Professional by the Building Performance Institute and holds a South Carolina real estate license. 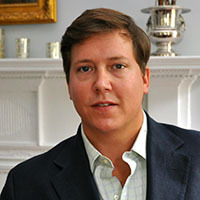 He has served on the Board of the Charleston Civic Design Center, and as a member of the Charleston Tourism Committee, the Charleston Short Term Rental Committee, and the Charleston Green Committee. He is past President of the Board for the Preservation Society of Charleston.